I don’t know if you’ve noticed lately, but there seems to be a new trend in the personality community towards “introversion unity”. You can find countless introvert comics, introvert memes, and introvert web pages across the internet. As an introvert myself I can relate to a lot of these resources. But some of these comics/articles/memes really get on my nerves. Some make me feel ashamed to be part of this introvert group. While we applaud our introversion, we may be unwittingly (or purposefully) offending or completely misrepresenting extroverts entirely. Extroverts are not the shallow, obnoxious, revelers they are portrayed to be across the internet. In fact, most of the strengths applied to introversion in these memes or comics apply more to imagination and creativity than introversion at all. According to Isabel Briggs-Myers book, “Gifts Differing”, extroverts outnumber introverts 3 to 1. This is probably why, historically speaking, extroversion has been considered “normal” while introversion has been seen as “abnormal”. But times have changed. Great advances have been made in understanding introverts, more introverts are expressing their needs through social media, and more introverts are able to work from home. We aren’t the “pariahs” we once were. It’s true that some introverts may still face pressure to be more extroverted, but it’s definitely a rarer occurrence. If you look up introvert comics on Google you will find hundreds of pro-introversion comics. You’d be hard pressed to find a meme or comic that criticizes introverts. 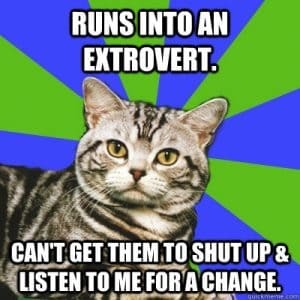 If you look up ‘extrovert comics’ you’ll find a HUGE number of condescending memes and comics like the one below. Really? I don’t know about you, but I’ve met plenty of introverts and extroverts who are terrible listeners. We’ve all seen those comic strips with the introvert reading a book, sipping tea and snuggling with a cat. But really, extroverts enjoy their fair-share of tea-sipping, book-reading, cat-snuggling fun too. My ESFP mom read countless books to me as a child. She introduced me to Charles Dickens, Agatha Christie, and Alexandre Dumas. And yes. She was an ESFP, a type which many intuitives like to call “shallow” or “flaky”. Then there was my dad, an ENTJ, who would gather us together to read theological books written centuries ago. Extroverts can love reading just as much as any introvert. They may enjoy discussing what they read more, or they prefer a social gathering now and then, but they are not the illiterate loudmouths that they’re portrayed to be. Shyness has nothing to do with introversion or extroversion. 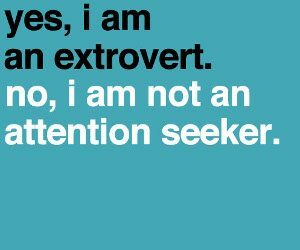 An extrovert can be just as shy, maybe even more so, than an introvert. Jung firmly believed that shyness was not exclusive to the E/I preference. Anyone can be shy. Just like anyone can be imaginative. Or anyone can hate small talk. What does it REALLY mean to be an extrovert? It means that your energy flows outwards, towards the world of people and activities. Extroverts put their energy out into the world more readily and more often than introverts do. That’s all. They don’t have a magical immunity to shyness. Nobody does. Extroverts AND introverts both enjoy positive social feedback from others. Neither one is innately more attention-seeking than the other. 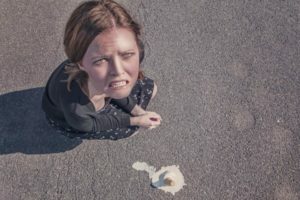 While an extrovert may crack jokes and circulate through a party with ease, the introvert may express themselves through writing a letter, or corresponding with their friends on social media. Extroverts may enjoy face-to-face affirmation more, but an introvert may light up with written affirmation from a friend or loved one. This is one of the biggest statements extroverts are especially tired of hearing. Yes, extroverts are sociable and energetic. That does not mean they have no depth or intellectual, philosophical interests. A lot of the introvert articles I’ve read attribute imagination and creativity with introversion. These traits don’t have anything to do with introversion. Just look at Walt Disney (an ENTP), Salvador Dali (an ENFP), or Ernest Hemingway (an ESTP). Are you going to tell me these people weren’t imaginative or creative? Introverts do not have the monopoly on depth. Everyone wants alone time. One of the amazing things about the MBTI® is that it confirms that EVERYONE is a kind of ambivert. Extroverts feel more at home when they can express themselves in the outer world. But they still need alone time. They just need less of it than introverts do. Extroverts may enjoy a lively crowd, in fact, they mentally may even NEED more stimulation to feel alert and content but that doesn’t mean they are innately obnoxious or over-bearing. I’ve met soft-spoken extroverts, loud extroverts, extroverts who listen more than talk, and extroverts who are activity-oriented but get bored during long conversations. I’ve also met introverts who are deep, introverts who are shallow, introverts who can talk non-stop with the right person, and introverts who are quiet and thoughtful. 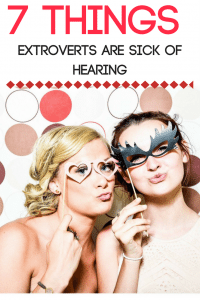 Just because extroverts may enjoy a loud party doesn’t mean they are inherently loud. And most of the time they have no intention of bothering you or “forcing” you to interact with them. I don’t think I’ve met a single person who just thrives on talking about the weather or which way the wind blows. Certain types are more likely to talk about day-to-day activities, projects, or family affairs, but this has nothing to do with extroversion or introversion. Do you feel misunderstood as an extrovert or introvert? Share your experiences or thoughts in the comments! Isn’t it a bad sign if grown people need “external stimulation” like babies need to be nursed? Extraversion is something that you can, and should, grow out of. That’s not to say you shouldn’t be social anymore. But it simply means you don’t have to rely on other people’s ideas. People really need to know about this more! I’m an INFP and I find the extroverts around me have various personalities. My ESFP sister’s looks like she’s living in the moment but i’ve once or twice listened to her talking the things she buried deep inside, so when people says ESFPs are shallow i feel like they’re only looking from the surface. Well, she /did/ talked for –1.5 hours straight–, the longest pause was probably about 10 seconds, and the only things that were out of my mouth were “uhuh. hmm. i see. ok.” as i absorbed each of her words because she talked to me on person (until my energy was really drained and my head hurted). But yeah, point is, not shallow. And definitely not stupid either, as she’s the smartest in our home, ambitious, genuinely caring, and have bright careers. Can’t believe those who says ESPFs are stupid. Who the fork correlates personality types with smart or stupid!? Same with her husband, genuinely caring and sensitive to the people around him, i mean, he can perceives what people are feeling (maybe Fe? ), if he senses i want alone time, he won’t bother me, and if he senses i’m doubting something, he asks. I literally just saw a “helpful infographic” describing extraverts as obnoxious predators. It depicts an introvert hiding in a bubble while an extravert sticks his arm in and tries to drag the deep, intelligent, yet defenceless soul out. Oh dear. All this time I’ve spent reading, writing, gaming, researching, painting, and theorising by myself, when it turns out my only purpose in life is to force some poor superior being to be my friend. Better go get on that. PS. My introverts are THE BOMB. Nothing turns my face into the cute blushing emoji more than an introvert friend who deems me worthy of his energy. So, introverts, I’m sorry for the few extraverts who have ruined your day by being loud and tuned-out to your needs. That doesn’t mean I need a few introverts to ruin my day in return. PPS. Susan, thanks for being the one to say it. As an enfp, I loved reading this. People just love behaving like prigs as a cheap alternative to actually figuring out how to grow up and interact with other people who are different than they are. You called it out nicely in this matter. I’m really glad you enjoyed it!! And I agree with people learning to understand others instead of just falling for stereotypes!